I love The Kilchis River. It's mine. It's yours. Let's take care of it. Well, that was easy! I don't have much time. I have to get Luke to school. I know where I'm lead, at least for a little while. Thank you, Lord! Who is Luke, some of you may be wondering? I have a foreign exchange student, here! All moved in! Already! Luke is from China, and "Luke" is his American name. One night, a long time ago, Bill and I were having dinner at Pirate's Cove in Garibaldi. I received a phone call from someone I could not understand. Now, I know that it was Luke! I tried to call back, but I couldn't get ahold of him. So, when I was trying to finally find a roommate, he called back! He was pretty desperate for a place, and even though I wasn't totally ready, he came to meet us on Saturday. Things are so different in China, social customs, etc. I hadn't met him before he said, no... in fact, it was through text that he said, "Can I move, then?" I said, "I haven't even met you!" He didn't understand, so I had to explain that I need to know that he is a good person. That he doesn't steal, or do heavy drugs, or is dirty. He texted back, "Oh. Thank you for telling me this. I understand, now." I have to go soon, and I have so much to write about. Frustrating! I will be back, though. Anyhow, he is ideal. Absolutely ideal. I only get him for one term, but I wish he would stay longer! Luke is kind, quiet, respectful, and studies hard. He thinks that I am going out of my way to take him to school. His Mother says I shouldn't, but I do. I like to help him when I can. Luke tells us many times he doesn't understand our slang, so we have to explain what things mean. Like if someone asks him, "What is up?" how he should respond. Now, David and I tease, "What's up, Luke?" He smiles, and says, "Not much!" Little things like that, that I never thought about are so hard for him. It's fun to help him understand. Yesterday, he shared his tea with me. There is a custom to having tea, and a method how to make it that I had no idea. Also, did you know that when you use a rice maker, you should not use the warmer? When it is done, you unplug it and let it sit for five minutes. Interesting! I had to hurry so fast, when he said he was moving in on Sunday! I had to call and have the carpet cleaned, and clean the room, and have fresh sheets, and oh my. It has been a whirlwind! It was fun cooking the last two nights, wondering if he would like what I cooked. I have learned so much every day from Luke, and it's just so interesting to learn all of our differences, and all of our similarities. I am so curious! Anyhow, I've just had more fun. David and Luke are about the same age, and had a great time last night playing video games in his room. It is so nice to hear noise from David's room. Laughter. It's golden. We all get along like peas and carrots. More later. Like I said, I'm taking Luke to school. On the flip side, Tammy has to put her dear, beloved cat down, tomorrow, and that's just awful for all of us, but especially Tammy. She's had Gypsy Rose Lee for 14 years. She's a persian, and if you look at my facebook pictures, you can see her eating our peanut butter pie. :) Our last suppers with Gyps. Then, I'm taking Gypsy to Tillamook to her final resting place in our pet cemetery. Bill will make a cross for her, and a sign that says her name and Birth date, and well, there she will be. Her body, at least. We all know where she is going. To Rainbow bridge. And someday, we will see her, again. I'm just so sorry for Tammy. We all go through this, and then we choose to go through it again, when getting another pet. Life is a whirlwind of ups and downs. Isn't it? Off to school I go. I'm beginning to think it's not possible to be a part time writer, musician, or anything. You have to give it your all, or fail. I keep thinking of words and thoughts that I just have to get down on paper, and then I do something else, and that leads me to something else. Then, I totally forget how I really felt at that moment, or what it was that I was going to put in my column. The death of my son, and the resultant grieving has put me into a phase where I can't do much of anything very well or very fluently. I think that if you capture exactly what you feel, then you've got something, there. If you can take your feelings and share them, no matter what media, and get someone else to relate or to feel them, then it's good! Very good! It's kind of the same as fishing and taking pictures at the same time. I'm convinced you have to do one or the other, or a poor job of both. Fishing is for me, but taking pictures is to share the same excitement you feel, and get someone else to relate to the picture. That's what I'm after. So, I either want to be selfish, and feel all the feelings myself, or take pictures, and capture words that explain exactly what it feels like, so others can feel that stirring inside of them, too! Come to think of it, it's the same with music. Is it the same with everything? I have a passion for all of these things; music, writing, art, and well? - so many more, actually. Maybe I should just pick one thing to do, and become absorbed in it. I remember my Mom's words, so many times. "Jack of all trades, master of none." I don't want to be that, according to my Mother. I'll be out on the river when I'm into music, and think of a melody, or a tune, and I just have to record it. Thing is, it's easier now with iphones. You just turn on record, sing it into the microphone, and tada! Saved! But, it's not quite the same, because melodies and the music I hear in my head has more parts than just a melody. It used to be that I'd have to scurry into the house, tell everyone or anything else to hold off till I emptied my head out. Downloaded it, into the piano! That's just no fun! I'm no fun to be around when I get so centered into something. I come off as rude, if you don't know me and my ways. But, then, when I'm done and I share it, I hope that it makes up for my temporary rudeness. I hope that the people I have offended enjoy the creation that came out of my rudeness, while they were trying to talk to me! People who know me know exactly what's up. I must stop whatever I'm doing. I kind of get this glazed over look, I'm sure, while I'm working out how to perfect whatever I'm capturing, and then turn on my iphone and whisper or hum into it. I just can't be casual, if something is going to be "good". I just can't be a master of many things, if it's going to be good. I can't think art and music and writing, all at the same time! Or, it will be a little good in a couple ways, instead of really good in one. Do you understand what I'm saying? I hope so! "Good" isn't the right word, I guess. It will be a little of "me", instead of all of what I was thinking... all of me. Oh well, never mind. I'll just try to capture my thoughts over the last couple days. I've been through the emotional ringer. As you know, I've been a bit plugged up emotionally, since my son, Andrew, passed away. I couldn't cry, easily, like I wanted to. I'd feel these emotions, and it was like when you can't think of a word, and you know it starts with a certain letter, but you can't find it. It's on the tip of your tongue. I'd totally feel like crying, my heart hurt so badly, but I couldn't release it. Maybe I was afraid that if I cried, I wouldn't be able to stop. Anyhow, Tammy and I both knew that Gypsy was at the end of her life. Gypsy is Tammy's Persian cat. She was beautiful and so crazy fun to be around. We had to put little Gypsy down this week, and it was a whirlwind of emotions. I ended up crying. That's all. I mean I cried a river of tears. I suppose that was Gypsy's last gift to me. I cried all the way to the beach. She was in a box in the back of my car, and Bill put her in the pet cemetery, here. I am making her sign, today. We have little crosses with engraved signs on each one. Every one of our chickens, our cats, our sugar glider, every critter we ever loved, and there are many. On the flip side, the other day I came home from town, and Bill said, "We have a new problem." They seem to be coming at us, fast and furious, these days. "Problem?" I asked. "What?" Our banty hens, two of them, have been broody, lately. "Broody" means that they want to lay in their boxes on eggs that the girls lay, and try to incubate them into baby chicks. Banties are known for being more broody that bigger hens. Bill wanted to take the eggs from them, and I begged and pleaded not, until he gave in. "Let them play Mommy if they want to! Please, Bill?" I could relate, actually. It's a maternal thing! It wasn't a problem, at all, in my mind. But, Bill thought it was. He revealed that he had been out in the chicken cage and heard a peeping sound. He looked down and found one. Just one! One baby chick, not a day old! It is so cute! SO cute! The funny thing is, the baby chick has two Mothers! Two banty Mothers sharing one chick and two more warmed eggs that may or may not hatch out in the next few days. "Who will get to be Mother?" Bill asked, very seriously. "Whoever!" I countered. "It doesn't matter, and perhaps they both will be. It's frankly none of our business or concern." Bill, as male as he is, wants to "fix" everything. But, in my mind, this doesn't need fixing. Let nature take its course, unless it looks like we can help. At this point, everything is fine in broody chicken land! We have a baby at our home! And so, life (and death) go on. The joy of a new birth, and the sadness of losing a beautiful cat that we all loved. I went out to see the new little baby, and one single little tear dropped down my cheek. I'm back! I used to be able to show emotion like this, over things that deserve a tear, and I so very naturally felt that tear of joy, and it materialized! It feels great! I think that since Andrew died, a part of me died, too. The freedom to feel things, and to naturally share those feelings got a bit plugged up. Maybe... just maybe I'll be able to write better music, create better art work and maybe... this column will be a bit more interesting? I don't know, but I hope so! Perhaps it also makes you better at what you do. Do you think? Do you think that since my son died, and I went through this awful loss and grieving, that I'll come out a better person? Could there possibly be some good in this? It's sure hard to think so, but I have to have hope and something... something, dear Lord, to look forward to. I was walking along the river yesterday, taking note of the changes in the river bank and bottom, brought on by the last storm. The rocks were wet, due to the lack of sunshine, now, in the canyon. The days are getting shorter, and the sunshine doesn't reach most parts of our river bank. It's cold and dark and shady, even when the sun is shining, up on the lawn by the house. Soon, there will be no sunlight, anywhere on our property. It's always a celebration in the early spring, the first day we see sunlight on the meadow. Walking along the river, I was met by a warm pool of air. I don't know where it comes from, nor why. It doesn't happen in any one place or season, really. It just happens, sometimes! Why? Does anyone know? I am walking along on the cool and dark river side, and I find myself in a warm spot. It's such a drastic change of temperature! It's so strange! (And no, it isn't a personal hot flash- but it almost feels like one!) It's the air! If I walk a few steps more, the temperature changes back to normal, and everything is again cool! Bizarre! It's always right by the river. You know sometimes, when you see a small cloud of fog, riverside? Not much, just a cloud of it, by the river? It's like walking into one of those, but there is no fog there. Just a brief, almost enclosed area of increased temperature. If anyone has an explanation for this, I'd surely like to know! I was collecting really nice agates like mad, yesterday. Seems like every storm, it churns up more great agates! It is a never ending supply, I guess? Collecting rocks is one of my favorite hobbies, next to fishing. Bill gets a bit upset about how many rocks are inside the house. But- I think of a pepper grinder, and that's how I think that the new rocks pop up. Even if the water didn't flow across the banks, which it did, last high water, rain just seems to turn up new rocks. I'd love to see a time lapse of say, a year, of just the rocks on the river. I'd love to see how and when they change position. That would explain a world of new agates to me! I am so sad about some friends that Andrew grew up with. He had a good friend. This tiny little gal. Once, when she was over, I offered her dinner. Andrew wrapped his big arm around that tiny little girl and said, "No. She doesn't eat. When she's hungry, I just hook her up to the humming bird feeder!" He was so cute. So funny. Anyhow, three months after Andrew passed, Jordon passed away. That was so horrible, and so odd. They were too young to go! But, they were very alike, and sometimes I wonder if God thought them too delicate for this harsh world. Anyhow, I began talking to her Mother, and we'd support one another, and talk about our losses. Two weeks ago, Jordan's twin, Skyler, wrote on Facebook that his Mother had passed away. She had written to me many times. I had written back. But, we had never met. She asked me several times that we should get together for lunch. She said it would be a crime if we never met, or hugged. That we had this tie, losing our children, which were so close to one another. I never made time to meet her, and now it is too late. How I wish I could have met her. I suppose that she couldn't find the strength to carry her loss. I will always regret, and wonder if I could have made any difference. Anyhow, I got up way too early, this morning. It seems I do that. I come to the coast, and sleep in late for the first couple days. Almost like I need to recoup from the city. Then, I get back on my normal '5 in the morning schedule', that I usually have, here. I'm going to go out and try a jig in the deep hole. Brrr. It's cold out. I'll try to find the warm spot! All I want for Christmas is a pair of saddle shoes. You know the ones. Everyone wore them in the early 70's and even late 60's. I know that because that's all I could fit into and all my Mom would buy me when I was young. I am a difficult fit. I wear an 11 quad A. Long and narrow! I've always had trouble finding shoes to fit. My Mom would joke that we were going to just tape shoe boxes around my feet and call it good. She spent hours looking for shoes with me. When I started the Nordstrom piano playing thing, the shoe sales clerks would let me browse thru the back of the store, to find a pair. That was so great, because none of the sales people wanted to spend 3 hours of their commission sales time, helping me find one pair of shoes! Saddle shoes are in style, now, and I adore them and get this.... they don't make them in my size, now! When I was young, I had the same long, skinny foot and that was the only style of shoe they made in my size, then. It was either that, or some awful, expensive old-lady shoes from Nordstroms. You know, "pumps". I chose saddle shoes. No one really carried an 11 AAAA or "super slim" except for Nordstrom's and they had two kinds. Saddle shoes or Selby pumps. Now I want saddle shoes more than anything, and they only go up to a 10! Pheh! No fair! Oh, how I wish I'd kept one.... just one of the many pairs I pounded through, playing prison ball out on the playground! Oh! Fun! I met ifish.net's "Deefly" up at the Kilchis park, yesterday! He is SO nice and he fly fishes and he gave me a couple larger reverse spiders for steelhead! Can't wait to try them! I bet they'd work for cutthroat, too! Thanks, Deefly! Nice to meet you! Ohhhhh but trying to get things in order after a sale is hard. The community went thru changes about 2 years ago, and it was hard, but we made it. Now, we are going through it again, and yes, it's hard, and yes, we'll make it! Recently a few users had trouble trying to get to ifish on their Android phones. It was direct them to Twitter. So, yesterday we fixed this. I hope that it's fixed for everyone. If not, please use the contact form, and let us know. It would really help if you could send in screen shots of any problems you are having, along with an explanation of what is happening. We will get through this, too! I am confident that if I can get through what I've been through in my life, I can help us get through this! I spent the day yesterday doing little things to spruce up the place. I blew leaves around. I didn't do much good. I just blew them from here to there, and there most of them sit, as my garden disposals are full! I had David put as many as he could fit into our weekly trash can. So, what do you bet a big wind will come along and blow my leaves everywhere, again? I look up at the trees and they seem full of leaves. Where on earth will those leaves go? If only we had tree suckers. Big machines that came along and sucked all the leaves off, very neatly, and into a big neighborhood truck. This raining down of leaves every other day is making me so tired! We do! We need a leaf sucker! I have one of those weeping willows and it is so tall! Little tiny leaves, everywhere! Makes me want to cut it down! I almost was hoping that it would interfere with the electrical wires and the electric company would say it has to come down. But, then I realized we have underground power lines. Dang. I'm out of luck, there. I've been talking about the show with Joe of O'Loughlin. I can't wait! You know, if you haven't gotten your design for the annual Kwikfish contest in, you'd better do it, before it's over! You can click here to get your design in and enter it in the contest. The entries are looking pretty good! I can't wait! If you'd like to sit in the booth with me, and help with the show, I'd love it! Just contact me and let me know. I'd love to get to know you, and I'd love the help! I'm trying to figure out if I'm going to do the Christmas party this year. It's so hard to pick a date when people can come, during that season. Last year, the count was down, and it scares me. Every year I worry if people will attend, and although we still did good for the kids, and had quite a few toys to donate, I just worry. I need a tee shirt that says, "I don't do worry". And then, I need to abide by it! I love this picture my friend Darla took! We were at the park. It was a sunny day, and life was good! Life is good always... but life was very good that day! Just warm sunshine, friends, and dog friends! It is beautiful out, isn't it? I'm about to pour a fresh cup of Dunkin dark coffee, and head out to the porch. I love my porch in the sunshine. Did you know that it will be very soon that we won't have sunshine on our porch? Like, ever? Not all day long! It will be shaded by the mountains for most of the winter. Yikes! Never was that more prominent and did it effect me more than when I got out of the hospital when my aorta ripped. Oh, my, was that ever a dark, cold time! I remember being so cold! I found out later, that was because I had no blood flowing to my legs. After I was flown to San Fran to fix that, I wasn't so cold. But, during that time, I was in a wheelchair, all alone one day, and I saw... no wait! Was it? Sunshine on the porch! Oh my! I had to get out there! It was still very cold, but sunshine! How was I going to get over the door jam and out onto the porch in a wheelchair? I was very weak. Turns out I tried, and got stuck! The heater was going full blast when Bill got home and found me one wheel over, and one wheel in the house, the door wide open! "Well? I was trying to get to the sun!" By that time, the sun was long gone, and I was freezing! Oh, those were the days... and for years after, the cold, dusty blue winter sky gave me the heebie jeebies, remembering those days. I'm over that, thank God, and on to enjoying the pale blue skies of winter. Oh, thank God! Oh! Hey-- the other day, I wrote about those weird warm spots on the river? A member of ifish wrote me that this happened to him, after he gave someone mouth to mouth, and he didn't think they made it. He thought I had been "visited!" You know what? I think so! I hadn't even thought of that possibility! I have never seen a ghost, or you know how some people get visited by the dead? I've never had any weird experiences like that, but... Now, I may have! You know, it was that day, and I do this often, but that day I said, "OK, Andrew. Help me find an awesome agate!" I do that, sometimes, as he loved agates, too. I'm not one to believe in hocus pocus, but... do you think it could have been Andrew "visiting" me?! I hope that is what it was! I'm so out of touch with these possibilities, that I hadn't even thought of that! Mayyyyybe! The thought makes me smile! 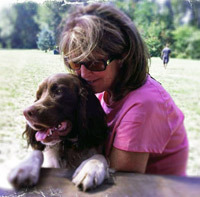 OK, out to have a hot coffee, and some smiles with the dogs! Have a great sunshine week, you guys, and may you be visited by the warmth of loved ones, past! How long does it take to fully recover from health problems? I would have said a year, maybe two. That was until I realized, and then Bill confirmed it with his fishing records, that Bill and I haven't caught Fall salmon in our new boat for ... well, let's just say, "MANY" years! Owie. That took a lot of guts to write. I have been searching my mind, fighting depression, worry and wonder trying to figure this out. Why is it that I'm not fishing! Much, anyhow. I probably fish more than most people with they could. But, I'm not a maniac any more! Without fishing, what am I? The same with music. Without it, I'm just a void! And that's how I feel, lately. When it comes to my passions in life, I feel like a big old glass of water, with drops of water at the bottom, instead of a full glass. I can't even write well, and I think it's because I'm not following my passions. I try to say that I'm just into my dog, right now, and I enjoy walking my dog, being with Willie, etc. That I like to garden, and make my house look nice. That's true, but, that's not totally right, is it? Here I sit, wondering why I'm not going fishing today. I'm supposed to be part of a team with the S.H.O.T. tournament with Bill and Bay City's new temporary Mayor, Rich Riley. Rich sure is a great guy, and I'd like to get to know him, better. So, why am I in my robe and not getting ready? Yesterday they went bobber fishing. I woke up feeling really awful. I spent the day in bed. Literally. I haven't done that in ages. But, today I feel good and I still am not going! I just can't make myself, and I don't... know... why! Am I depressed? I don't think so?! I don't feel depressed! Depression, I think, is kind of a luxury. I don't have time to be depressed! LOL. I come here to the coast after being in Oregon City. When I'm there, I'm so busy trying to keep the house nice that when I finally come back "home", I just want to rest, toss a fly out onto the river, and relax! I think, well, maybe it's because of my health? I was reading my columns way back to 2004, and 2005, where I was really into the thick of fishing. In one column, I was giggling because I had no other life, than fishing! I did it every day! We caught so many fish that we had a joke to catch more. Bill or I would say, "What in the world would we do with more fish?" And that would bring on a bite! It was so funny! I really enjoy reading about other people's adventures. Maybe... maybe I just need to start doing it, and it will all fall together, again. 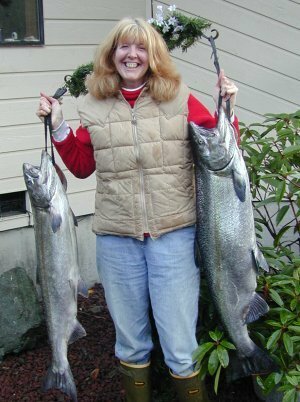 Since those very fine days of fishing madness, I have dissected my aorta, collapsed a lung, detached a retina, and been through breast cancer, chemo and radiation. So, is that it? Am I just tired? I just don't know, but this has been one of the most difficult things to admit on paper. Here I am, "Ifish Jennie", and I'm not fishing! On the flip side, in good news, I have a brand new pink teddy bear! I got it because I passed my three year mammogram! YAY! I remember one very fine day, many years ago, when I pooped out on fishing with the guys. I was just cold, darnit... and I wanted to go home and build a fire. They tried to keep me in the boat, by saying how many fish they'd catch. I told them I'd catch my own, at home, after warming up by the fire. Guess what? They came home really late, after dark, and were skunked. They were greeted by two huge fish, laying in the gravel. "Who caught these?" Bill inquired, pointing to them with the toe of his boot. He thought someone had caught them, and given them to us. Dang, I love those memories! Maybe today... Maybe, just maybe, I'll go out and catch my own fish, and when they get home, maybe they'll be skunked, and I can do a replay. I don't know, but I do know that I want my fishing crazy, back. You know, I've never been that excited about Fall chinook. Steelhead is when I usually get really excited. So, maybe I'm just on wait. I wish there were some way to tell all the would-be moderators, that wrote in and volunteered their time to help, that there isn't anything personal about my not acting on adding any new moderators. It's just that I have too many eggs in my basket, and I wish I could apologize personally, for not telling each one of the very kind people that it's not at all personal, but then again, the same excuse applies! So, I thought as long as I was thinking this, I might as well write it down, in hopes that at least one of these 'moderators to be' might see it. It's not personal! It's not that I don't like you, or want to add you. It's that I have my hands in many different things, here, and I just can't get to all of them! And it's not even that I don't have time! It's that I don't remember what to do, when I do have time! Does that make sense? I need to have a list, and the minute I think that I need to do something, whether I have time then or not, I need to write it down! That is going to be my priority this week! I have a list somewhere on the mod board, of everyone who wrote in, at least! So, I'm going back to that list, hoping of all hopes, that I didn't forget to write one or two of them down, and I'm going to send them this! Cut and paste is better than nothing at all! Even though I "stepped down" as moderator, I still seem to be moderating. I can't tell you all the times that I have stepped down, and then stepped back up, when I can't read ifish, due to the bad language or fighting. And it's not that the mods don't do a great job, as it is, it's that they have the same problems, I think! Please, while you are reading the discussion board, if you come across any of the above, alert it! Click on that that little red triangle by every post, and fill out the text box why you are alerting the post, and then the mods will see it, and fix the problems. I think it's my life goal to make ifish a family friendly discussion board that everyone can read and feel good about. I think the latter is my main goal. I've always wanted ifish to be a "feel-good" place! Mostly, because there is so much crud on the internet. This is my little fishing hole where everyone can be welcome! That's a big enough goal as it is. Don't ya think? Alrighty. Didn't mean to write a column, but I just felt so badly about not acting on adding moderators, and had to write something, somewhere! Now, I'm going to that list, to send this to each one of those moderators to be. They were kind enough to volunteer their help, and I feel rotten about not responding better! That breaks my number one goal. It just doesn't feel good! Oh. I had a "heavy" yesterday. Please, if you've lost someone that you love, see if this "letter" doesn't help you. It sure helped me! If you don't want to watch the video, just read the letter, here. It was so "Wow." to me. When the boys and I went to Maui, which was a dream for me, Andrew found out that his hero, Ram Dass, would be in Maui at the same time, giving a seminar. I wrote to Ram Dass's people, to ask if there was any way that Andrew could meet him. They wrote back, and when Andrew sat down at a table, where he was sitting, Ram Dass knew Andrew's name, before being introduced! Anyhow, that was Andrew's dream. To meet Ram Dass. Andrew had read almost everything he had written, and he adored him. I'm a Christian, so I didn't know that I would agree with everything that Ram Dass stood for, but you know, this letter was written for my heart. I don't know if people will think me unchristian for being so touched. I don't think so? But, I am touched by it! So, so deeply! This letter has touched off a healing process in me that I am amazed by. It's almost like it was written from Andrew's heart to mine! I am printing it out, and keeping it in my wallet to read, whenever I am overtaken by grief. After hearing it, I went down to the river, and cried and talked to Andrew. I talked and thanked him for our time together. It is the true start of being thankful for our time together, instead of keeping a heart full of rage and disbelief that he was taken from us. I find the above a more healthy way to look at things, and the only way that I can keep living and loving. It just rings so true. Especially the part where he talks about the pain, and how this is the only way that you can see God's love. I often think about God and how He lost his only son, and how he knows the pain that I endure. I hope that sharing this helps even one person out there. Now, see? I've almost forgotten to go tell the moderators how much I appreciate their volunteering to help! Dang! I'm in Oregon City, trying to get the house in shape, as always. I wonder sometimes, if this house was a good idea for me. I mean, it's a bunch of work! And, it's so expensive that I have zip-zero money left over towards the end of the month! I know now, what it's like to live paycheck to paycheck. In fact, I'm anxiously waiting for the first of the month, right now, so I can go grocery shopping! Is it here, yet? It is a bit scary! Then, on top of everything else, I received my property tax bill, yesterday. Injury upon insult! Yikes to that! Today was an emotional day for me, as I wrote this post. Did you see that segment about those two children killed while playing in the leaves? That didn't happen to me. I'm lucky. Do you know how many children are in the hospital right now, and not home with their family? That's not me. I'm lucky. I have my child at home. Not only does it mean so much to me to keep our community alive, and do things like the "Christmas for Kids" at ifish, but doing things for others while knowing what they are going through, makes me realize that I'm so darn lucky! Yes. Even after it all. Yes, even if I have no money. Yes, even if I lost my beloved son. Yes, even if I was diagnosed with triple negative cancer. Yes, even if I have an aneurysm. I'm lucky. I'm a lucky dog! I have so much to be happy for! So much to thank our Heavenly Father for! In fact, when I look out at the river that I have to fish in and to enjoy, I feel spoiled with greatness. I can't believe what I've been blessed with. I have the river, I have the ability to physically get out there and to fish it, and I have so much more! So, I ask you from the bottom of my heart, to count your blessings, and please... be a part of our Christmas celebration. I'm counting on you. The children are counting on you. You are there hope in Santa Claus! If you aren't familiar with this celebration at ifish, we get together and bring brand new toys for the kids at Randall Children's Hospital at Legacy Emanuel. We have it at Pietros in Milwaukie, usually, and we meet one another, put faces to names, raise a glass, and eat a bunch of pizza! Those kids have so little to hope for, if they are in the hospital at Christmas time. Let's not let them think that Santa forgot them, this year. The presents that we gather and bring for them means so much to them! I feel so selfish, being upset about living month to month when I turn on the faucet and hot water comes out, at command. Do you know how many people would kill for this luxury? There are always people who have it so much worse than we think we do. So, celebrate! Be thankful for things that you have, and let's get together and give to others. It's a great way to put a smile on your face, even when we think that the going is getting rough! Please make time in your busy schedule to join us. Let me know about it, here. I'll do my best to accommodate as many people as possible! Oh, God, I pray.... Make this be a huge success! Let ifish gather presents for these kids, and let us touch their hearts and bring a smile to their faces! And please, dear God, help ifish come together in this time of fun, and love one another! Tammy is moving out, tomorrow. So excited for her! So proud of her! So.... sad for me. Isn't self pity the worst? I've known Tammy ever since I was about 5 years old. I met her in Kindergarten. 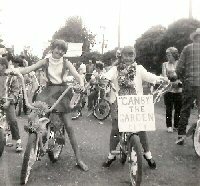 Way back then, we were in the Canby parade together, on our little sting ray bikes. I have a picture to prove it! Man, has time flown by. Her car is packed. She will drive 8 hours away where she will begin her first job in the career that she went to school for. That's the farthest apart we have ever been! That's way, way away! I'm so proud of her, though! She finished her college degree just last year. She went back to school after a big life change and challenge, and finished up school. Now, she's on her way! She's going to be a professional gal! I wish her much luck and success! Thing is, I know I'm going to cry, when she goes. The house will seem so empty. It feels like another loss to me. Good for her, but is there any good in this for me? You know, except the fun of watching her succeed. That's neato! We lost Gypsy, her cat, just a month ago. That was another loss. And, of course, I lost Andrew, my son, just a year ago. Well, a year and two months, ago. I fight that, as it gets longer and longer. I don't want it to be years ago, as then, people will think I should "get over it" by then. I won't ever get over it. I don't even want to get "over" it. I'll just get by. Never "over". I'll just go on. But, not over. Ever. Tammy will always be my friend. I'll see her again. The empty house thing seems to get emptier, all the time. First, I lost Kilchis. The house seemed so empty. Especially the bathroom. Dogs follow you everywhere, just like cats do! I was never alone in the bathroom! But, then I lost Andrew. With Andrew being gone, the house became so crushingly quiet. A painful, hush-quiet. Then, a year later, it was Gypsy. Gypsy had this awful "meow" that made me laugh. It was like a growl, kind of, but pitiful! I miss that pitiful meow so much! The quiet became even louder! The other day I was in the kitchen and I could have sworn Gypsy was at my side. I looked down to make sure I moved around her, and she was gone. Could she have really been there at all? I stopped to think about that for quite some time. I almost believe that she was! The house is quiet, right now. Tammy left to go out to dinner with her friends from work. David and Luke (Our new foreign exchange student) went to go pick up chinese food. This is kind of what it will be like. Quiet. David is pretty darn quiet. So is Luke. Even when they are home, they are quiet! I'm cold! I kind of feel like taking a hot tub, but I think it will make me miss Tammy too much. Every little sound rings hollow. Every little shiver scares me a bit. I don't want to feel sad, any more! Sadness has come to scare me these days. I used to revel in sadness, and kind of want to experience it, and take that time to reflect. I know I'll find myself going down the hallway to see if Tammy is asleep or not, and then remember she doesn't live here, any more. When I wake in the night time, I always know Tammy will be up to keep me company, when I can't sleep. She's always up late. I'll sure miss that. I'll miss our hot tub giggle nights, when we sit in the hot tub and discuss the latest... well? The latest everything! We'd laugh and talk until it got too hot in there. Then, we'd shiver and get changed and go our separate ways till morning coffee. I'll miss discussing our favorite program, "Nashville". Sure. There were times we bugged each other, and times we down right got mad at one another. They say that friends should never room together, as you'll sooner or later lose them, as friends. Not true, in this case. I lived with her for two years, and I love her more, now, than ever. She bugged me a bunch, at times, but never enough to consider that I didn't want her as a friend. She is finicky and doesn't like a lot of things to eat. I like everything and can't imagine being that finicky! Makes me laugh, right now, but boy did that bug me at times! And, of course, no one ever cares about your house like the owner does. They don't have that same "pride of ownership" thing going on. Therefore, I was more concerned over keeping the place nice than she was. That bugged me, sometimes, too. Tammy is still, and always will be the best friend I've ever had. The one thing we have in real common is our love for our Heavenly Father. I think perhaps that is what kept us from ever giving up on each other. And so, if you are reading this, Tammy, know that I love you, and wish you the very best, always. I sure will miss you! At least I've gotten over that awful time when I was so bottled up with bad things that I couldn't cry. Here they come, right now, in fact! Tears! I'm so proud of you, Tammy! Another sunny (but cold!) beautiful day! I'm taking the day off to be with Willie. Willie had a tough day, yesterday, as did I. Off to the puppy park, we go! Have we been spoiled with awesome weather, or what? I have been so delighted by all of this sunshine! Today is Halloween and what will the weather be? Oh, don't tell me it will rain on the kids! It's nearly November, and I'm still picking fresh basil and tomatoes! Savvy boater of the month! It was fun to fill out, but now that I read it back, I wish I would have been more disciplined about my writing. I know how! I do! Well, mostly! And, what I don't know, I have books to look up in order to write with more style. Oh well. It is what it is! One thing is for sure, I just write what my brain says, so there you go! Welcome to my mind! It goes faster than my fingers do! We sat on the park benches and visited with our friends. I have so many park friends! Does that mean I'm old? I think so! I don't know if I know more people's names or dogs names, but I enjoy visiting with them all! Willie has as many friends as I do! There is this one little dog there. His name is Stewart, and everyone loves him, canine and human, alike. He's just one of those souls that is endearing to every soul! I love him, too! But, Willie doesn't actively associate with other dogs, really. He doesn't rough and tumble like a lot of the dogs, do. But, with Stu? Oh, yes! He roughs and he tumbles and he barks and he chases and he loves, loves, loves Stewart! Isn't that funny? Not only that, but Willie actually becomes jealous when another dog butts in. It's like, "Hey! That's MY friend!" Today, though, is my day. Willie will have to be patient, while I try to get things done. Tonight is Halloween, and I must have candy for the door! Make sure to stop by and "Trick or Treat!" I am a bear about that. Either you say "Trick or Treat!" and "Thank you" or you get no candy! If you don't say Thank you, I'll take that candy back! TRICK!